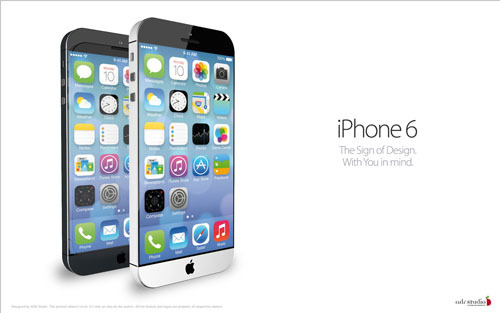 You are here: Home / Opinion / Will the iPhone 6 be the iPhone Air? It’s no secret that Apple tries to make every product they release lighter and thinner, but the iPhone has been the slowest device to follow this path. When Apple released the MacBook Air, it was the thinnest notebook computer in the world. While other devices have since claimed this title, it’s a good point to make that Apple wants their devices to be the thinnest out there. So what does this mean for the iPhone 6? Apple recently released the iPad Air, making it the thinnest full-sized tablet Apple has released yet. 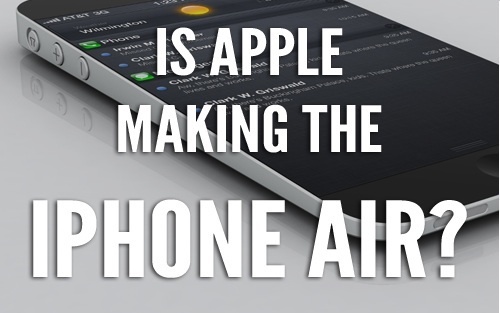 With this, there is an Air version of their notebook and tablet, so it only stands to reason that they’re planning an iPhone Air as well; something to blow away the competition and to reinvent the smart phone category they basically helped to form. There’s more to this than just tossing the Air moniker on a new iPhone, though. Changes will need to be made. The biggest limiting factor in regard to the size and weight of the iPhone is the battery. Battery technology hasn’t grown as quickly as the devices they power, so the battery limits the device size more than any other component. This may be why Apple recently applied for a pair of patents for unorthodox battery designs including a curved battery. These new batteries could be used to change the shape of the new iPhone and possibly allow the phone to gain the tapered design of the MacBook Air. These battery patents could also help Apple to get more battery into a smaller space, so less battery is needed for the most effective charge possible. Whatever the case, these battery patents will most likely mean big things in the near future. Apple will more than likely stick with the 4.065-inch screen it currently uses on the iPhone 5/5S/5C, as changing screen size or resolution would cause issues for app developers and get it too close to the iPad Mini. The tapered look of the MacBook Air could be paired with the smooth, rounded edges of the iPad Air to give the new iPhone a completely new look and feel that would align it to the other products Apple would like you to buy. While the screen would ideally stay the same size, the device around it could shrink to make the screen go to the edge on all four sides. By removing the physical Home button and replacing it with a touch-sensitive sensor, it could become part of the screen. This would shrink the physical footprint of the new iPhone while leaving the screen the same size. As for colors, Apple will most likely stick to the colors available for the iPhone 5S currently; leaving the 5C to have all the colors it has now. The iPhone Air would be classy and simple, just like the MacBook and iPad Air currently are. Samsung has been toying with curved screens for some time now, and they are starting to get to the point that they may be viable for Apple to start using. 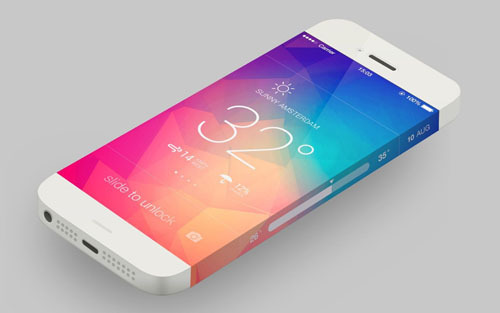 Could the iPhone Air have a curved screen? If it did, the curve would be minimal and only used to make the phone’s design or battery work as it needs to. As seen in this Samsung patent application, Apple could make the screen wrap around the sides of the device, replacing the physical volume buttons and silent switch. The curved screen wouldn’t be wild, but it would give enough curve that Apple could use the sides of the screen for more than just a few buttons. This curved screen may pair well with the angled battery, too. Like I mentioned above, the physical Home button is on its way out. Steve Jobs’ vision of the original iPhone was a device with no physical buttons, leaving everything up to the touch sensitive screen. This was obviously not possible at the time and the standard Home, power, and volume up/down buttons were used along with the silent mode switch. With the inclusion of the Control Center in iOS 7 however, volume and silent mode are easily controlled via the touchscreen. With enough people familiar with how this works, Apple could easily cut these buttons out of the iPhone Air. The Home button could become touch-sensitive too, leaving only the power button as the lone physical button. This would remove some components from inside the phone and allow for more battery, screen, or just a smaller footprint. One of the reasons Apple products are as popular as they are is because they defy convention in their design and make products that no one expects. Do I think there will be an iPhone Air? I would say this is a pretty safe bet, but as for what it will look like or features it will include, all we can do is make educated guesses and see what Apple surprises us with.